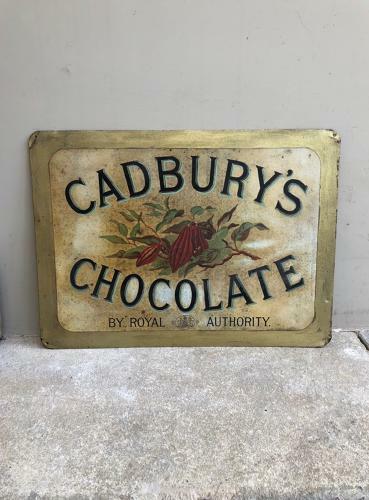 Rare...Early Shops Tin Advertising Sign for CADBURYS CHOCOLATE....late Victorian. On the front at the base "BY ROYAL AUTHORITY" and on the back black on gilt "CADBURYS COCOA. ABSOLUTELY PURE THEREFORE BEST NO CHEMICALS USED. Great size with four holes in the corners to wall hang. The outside "frame" has been gilded and it looks like the letters have a painted blue line round them.